Having the ability to hear is something most of us take for granted in our everyday lives. But as we get older, our hearing abilities can decrease without us even noticing at all. Recently, researchers at the University of British Columbia’s Okanagan campus found the loss of hearing can have a potentially negative effect to seniors in our community. Read on in this blog post to find out why that is, and how those researchers discovered this unnoticed issue in our community. Our team of audiologists at Audiology Innovations in Calgary provide audiologist services to adults in the Calgary community. Our services include complete hearing evaluations, listening training programs, hearing aid consultations, customized earplugs, hearing aid repair and more. Schedule an appointment with an audiologist at our office today. Initially, the researchers launched a pilot program that encouraged seniors to walk and exercise in groups to improve their overall health and avoid feelings of loneliness and isolation, which is already a common issue among the senior population. The researchers thought that if they could get seniors to interact with one another while working on their physical fitness, they’d result in overall happier and healthier lifestyles. The program was called “Walk and Talk For Your Life,” and it included about 300 low-income seniors. When the researchers noticed the results of the program weren’t as positive as they anticipated, they found the seniors’ fitness, socialization and physical well-being wasn’t the root of the problem. 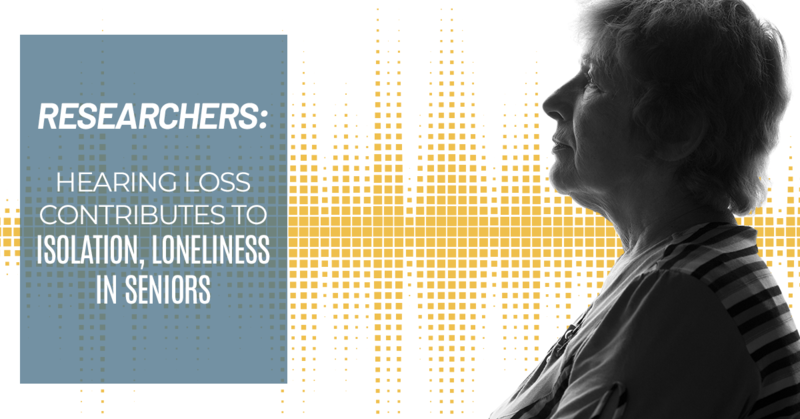 Rather, the researchers found the seniors simply couldn’t hear what was going on around them, which as a result, caused their feelings of isolation and loneliness. One researcher noted that when people can’t hear, they tend to shy away from social events since they can’t hear jokes, questions or general conversations. This can stem feelings of embarrassment among the elderly population, especially if the senior previously had exceptional or adequate hearing. Hearing loss among the elderly is fairly common and can generally be attended to with the help of an audiologist. In fact, according to data provided by the Canadian Hearing Society, hearing loss is the third most prevalent chronic condition in older adults — about 46 percent of individuals between 45 and 87 years old deal with some sort of hearing loss. Check out our list of hearing services at Audiology Innovations today to see if one of our audiologists can be of help to a senior you know. The researchers said when seniors are lonely and/or isolated, they have higher risks of developing dementia, depression and over decreased physical fitness. When a senior isn’t in their best physical shape, they are more prone to falling and increased hospital visits. To combat the seniors’ hearing loss issues in the pilot program, the researchers put those who had trouble hearing into smaller groups and into rooms that were more acoustically-friendly. Those seniors also received help and advice on hearing education, which exposed them to hearing aids and counseling so they could take charge of their hearing issues head-on. As a result of these simple yet substantial changes, the seniors saw decreased levels of isolation and loneliness, and their overall physical fitness and health improved drastically. The researchers eventually argued in the Journal of Aging and Mental Health that although community exercise programs are great tools for improving seniors’ general health and socialization, program directors need to address potential hearing loss issues of the seniors who are involved in their exercise programs. At Audiology Innovations, we agree with that sentiment and think it’s important to address and bring awareness to hearing loss issues in our community, as they’re not always as obvious as you might think. At Audiology Innovations, our audiologist team knows how to work with each of our patients to find a hearing treatment that best works for them. The services at our hearing clinic range from hearing evaluations to hearing aid repairs and adjustments for adults, and we always strive to find the best solution for those with hearing struggles or hearing loss in the Calgary area. If you or somebody you know is in need of services from an audiologist, feel free to reach out to our office today by calling (403) 252-4722 or by filling out our online form. We look forward to hearing from you.